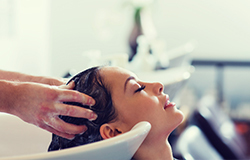 Luce Salon hair cuts begin with a relaxing scalp massage followed by shampoo and conditioner with the luxurious AG Hair Cosmetics and Kevin Murphy product lines. Our independent stylists will always assess your hair and concerns. 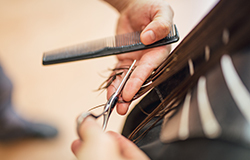 We offer women's and men's haircuts, hair styling, and even dry cuts. Kids love Luce too - we offer under 12 haircuts. We are happy to offer SBCC students 10% off haircuts with a valid student ID. Our talented hair stylists offer various hair coloring services. We offer base color, highlights, toner, and ombré. Color balancing and glossing covers your roots through ends. We also offer what is known as 'breaking the base' which lifts and alters your base color at regrowth. Replenish every strand of hair with intense moisture. 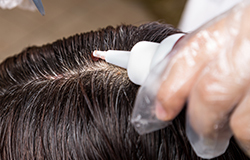 Keratriplex repairs and returns luster to the hair. Ideal for color-treated and chemically processed hair. YUKO Japanese hair straightening gives you shiny, straight, low maintenance hair that you've always wanted. No matter how curly or frizzy your hair is, YUKO will give you the hair you've always dreamed of. 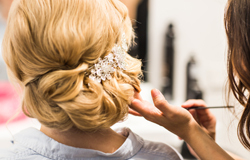 At Luce Salon, we know your wedding is one of the most important and exciting days of your life. We want to make your wedding day experience as perfect and stress free as possible. Our talented stylists and makeup artists have a way of making the ordinary, extraordinary by having your outer look express your inner beauty! For your convenience, we offer both salon or on-location services. All prices are 'starting at' and subject to change dependent on density and length of hair as well as stylist.